This train is only medium full, I have been on much more crowed trains in Tokyo, where you can’t move. The interesting thing about this shot is the advertisement for boxer briefs in multiple colours and patterns. In Tokyo you see more adverts for fancy men’s underwear (than in Australia). While there are still ads for women’s underwear, there more a balance. The social structure allows men to be more concerned about their appearance, without people queerying their sexuality. And the man on the ad reminds me of Laurence Llewelyn-Bowen from Changing rooms. 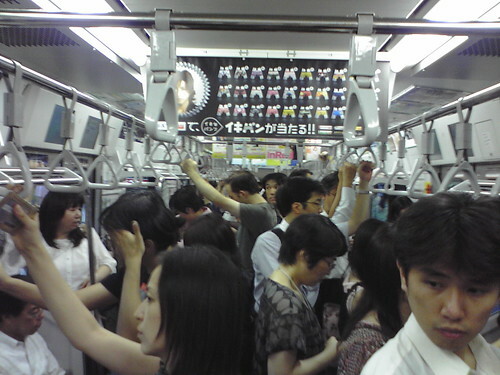 This entry was posted in Photos, Travel and tagged advertising, crowded, Japan, people, Tokyo, train. Bookmark the permalink.